The Uranium ETF intend to invest at least 80% of its total assets in the securities of the Solactive Global Uranium Index companies and in depositary receipts based on the securities in the Index in approximately the same proportions as in the Index. The annual expense ratio amounts to 0.69 percent. Investing in a concentrated uranium mining ETF such as the Global X Uranium ETF is an easy way to get exposure to the sector. URA is a welcome addition for investors looking for general exposure to uranium miners interested in benefitting in the supply/demand dynamics of uranium coming out of the ground. Regardless of where nuclear power plants are built, and who builds them, they will all need uranium and the increased demand that comes from these new plants is likely to create upward pressure on the uranium spot price helping all uranium miners. Currently, the Uranium ETF is the most concentrated Uranium-themed ETF around. At launch - November 5th, 2010, it owned holdings in just 23 uranium miners and explorers. Follow the current composition of the Solactive Global Uranium Index. 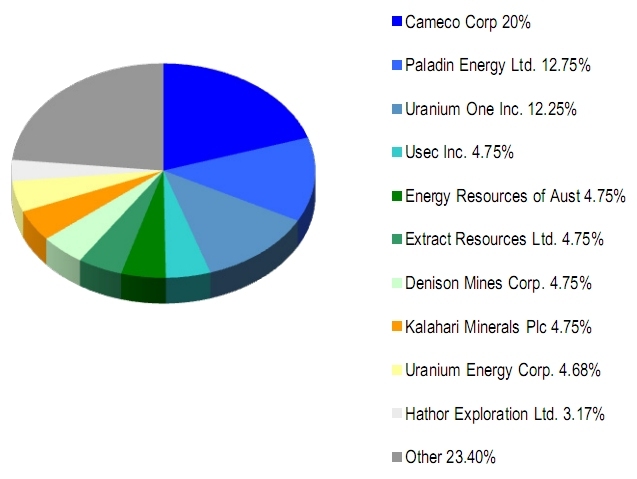 URA's largest holding, at launch, is the Canadian uranium miner Cameco, which accounted for 20 percent of the portfolio, while URA's number 2 and 3 holdings (Uranium One and Paladin Resources) make up another 25 percent of the Uranium ETF. When looking at the individual holdings at launch of the ETF, one can only surmise that the entire weight for the UK covers Kalahari Minerals PLC which is listed in London but mines various resources out of Namibia. Also included in the Uranium ETF is Extract Resources - 41 per cent owned by Kalahari Minerals- , and several other miners with uranium activities in Namibia and elsewhere but which have their main listing in Australia. Most of the holdings of URA are on foreign exchanges. Whilst listed on the New York Stock Exchange, with this ETF you obtain exposure to the international uranium mining industry without the hassle of foreign trading.